Nothing stands still, especially in case of modern technologies. This is also subject to such a fast-growing industry as CRM. However, the most recent statistics help us catch those changes. What is waiting for CRM industry in future? 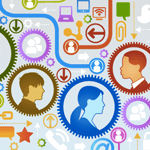 CRM systems in 2015 – how will they look like? What are the latest trends in CRM? You will find the answers for all these questions in a new article. Here it is. The CRM industry continues to grow at a staggering rate, and each year new statistics are reported based on CRM trends. In 2014, we saw increased use of CRM software on mobile devices. This was aided by businesses increasingly adopting cloud based CRM solutions, allowing their employees to access the software anywhere they go on the smart device of their choice. Those who have embraced these technologies have seen a huge improvement in both the adoption of CRM software by their employees and the meeting of sales quotas. But, which statistics should you pay close attention to? And moving forward to 2015 and beyond, what will happen? In this data-driven blog post, we take a look back at some of the most important CRM statistics released last year, the reasons behind them and the impact it will have on your business in 2015 and beyond. Since the very early days of CRM, some businesses have struggled to get employees to adopt and use the software. However, with increasing use and dependence on mobile technology those companies using mobile CRM solutions are seeing far higher adoption rates. Offering mobile CRM access does not just increase use of the software, but also the productivity of the workforce. Statistics have shown a rise in productivity of around 15%. And it doesn’t stop there. Users of mobile CRM are achieving better results! Research by Innoppl Technologies showed that 65% of sales reps who have adopted mobile CRM have achieved their sales quotas. While only 22% of reps using non-mobile CRM have reached the same targets. This information is filtering down to both businesses and their employees. The chart below shows that 48% of CRM users now access their software from a smartphone, with 45% accessing from a tablet. Although this figure is still lower than that from a laptop or desktop, this rising use from mobiles and tablets means that 81% of users are now accessing their CRM software from multiple devices. It’s this increasing need to access their software from multiple devices and locations that has led to the rise of using cloud based CRM solutions. 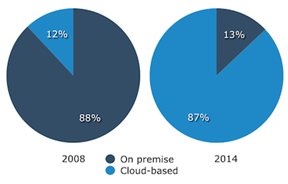 We can see that 6 years ago only 12% of businesses used cloud based CRM – This figure has now increased to 87%! “Cloud” vs “On-site” CRM system? Make the choice easy! For this reason it is thought that cloud based revenue will likely make up almost 50% of the 2014 projected $24 billion CRM sector. But, what does 2015 and beyond have in store? A forecast from Gartner anticipates that the customer relationship management market will be worth $27.5 billion worldwide in 2015. Rising to $37 billion by just 2017. But where do these projections come from? Since 2011 each year around 70% of businesses have stated they plan to increase spending on technology. The figure remained the same in 2014. This year on year investment is seen necessary by most businesses in order to keep up to date with the fast changing digital technology industry. This is highlighted by the fact that just 2% of businesses plan to decrease spending this year. We can see that CRM software leads this technology investment, with 49% of businesses planning to increase spending. This is not just to keep up with their competitors, but also as a result of improving sales. 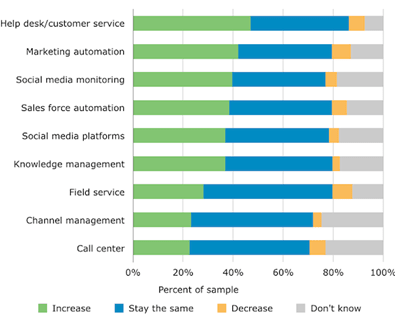 And in the chart below, we can see a more in depth breakdown of how businesses plan to invest in CRM related technology. Topping this table are the 47% of businesses planing to increase spending on help desk and customer service software. The investment in customer service software shows the intention of businesses to retain existing clients. By not only improving customer service, but also providing online self-help options. It’s not only customer service software that companies are investing more in. Email marketing spend sees the largest share of the digital marketers’ wallet in 2015 as 60% of surveyed respondents plan to increase their email marketing budget, which makes a lot of sense given email’s consistently highly-rated ROI – $40 return on every $1 spent. Not only are marketers’ seeing increased revenues, but as the customer experience takes the top spot in marketing priorities, delivering personalized marketing messages through email marketing is a sure fire way to beat the competition and build a brand that consumers trust. 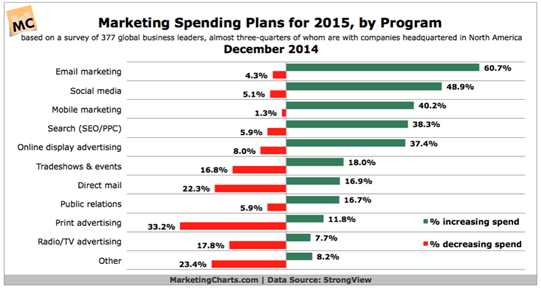 All of these statistics and research point towards 2015 being the year of the customer. We live in a world where 80% of consumers will research your product online before making a purchase, 87% will use their mobile device to shop and will use several channels to interact with your brand. In order to engage potential customers across multiple devices in multiple channels, you need data. And with CRM software, you are able to create a 360 degree overview of each person you connect with. The CRM industry has seen staggering growth in recent years. And 2014 was no different. Last year we found out that overall CRM usage increased from 56% in 2012 to 74% in 2013. Broken down this statistic showed that 91% of businesses with over 11 employees now use CRM, compared to 50% of those with 10 employees or less. This growth was in no part down to how effective its users found it to be. With 74% of them saying that CRM software has improved their access to customer data. Businesses will continue to increase investments in CRM solutions. Fueled not only by improving results, but also a need to keep up with their competitors and retain clients. 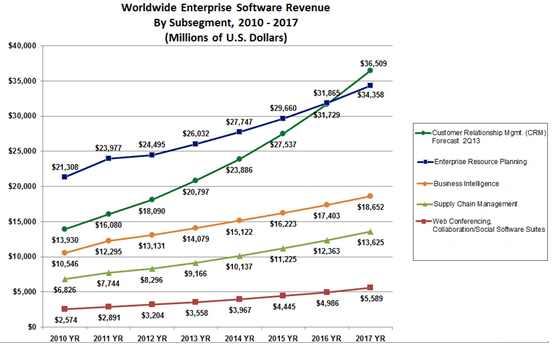 This is all expected to turn the CRM sector from a $24 billion industry in 2014 to a $37 billion one by just 2017. Well, if you are a business who is yet to adopt CRM – now is the time to get it, with half of your competitors already on board. Also, if you only have your CRM solution via a PC or laptop, its time to go mobile. When evaluating your CRM software options, it’s best to give your employees the possibility to work anywhere and on the device of their choosing.